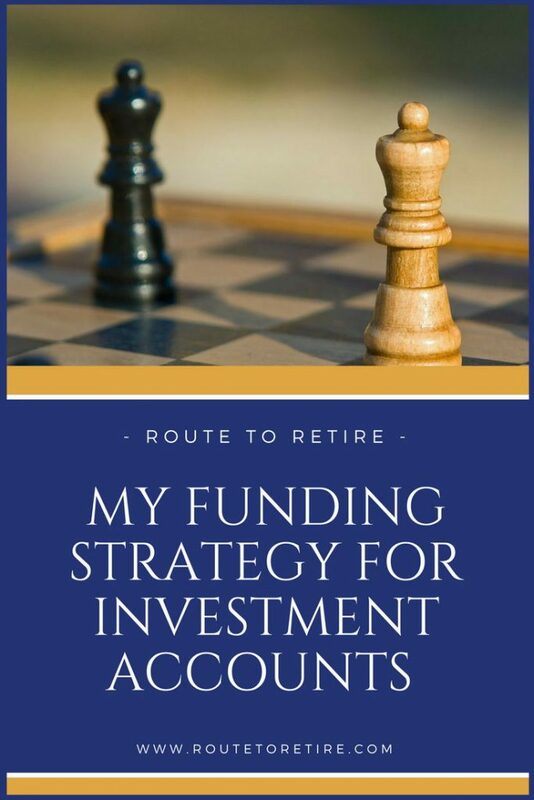 I’ve had friends that have asked what my strategy is for funding my investment accounts. In other words, what order do I recommend contributing to various retirement accounts? This topic’s definitely going to vary based on your own specific circumstances. Things like employer matches and tax-advantaged accounts make a difference in which accounts make the most sense for you to fund before others. Depending on what your game plan is and what options are available to you can make all the difference in which investment accounts to fully fund first. Regardless, I thought I would share the strategy I’m currently using for our own investment accounts. Before we get rolling though, please note that I’m not a Certified Financial Planner, or a CPA, or anything fun like that. I’m just a guy (albeit an awesome guy!) trying to get to financial freedom as quickly as possible. And by that I mean, talk to a professional before just rolling with what I say. But before even considering a similar plan, make sure that you’re already taking care of eliminating any debt you have and that you’ve built up a cushion with some type of emergency savings. This is my employer handing me my 401(k) match or a bag of dog poop… I’m afraid to know which, but something really stinks around here! This one’s pretty much a gimme. How anyone can pass up free money is beyond me. My employer offers us 35 cents on the dollar with no max. In other words, I can contribute up to the federal max and I’ll get an instant 35% return on my money before it even has a chance to do anything in the market. So in my circumstances, I’ll definitely continue to max out this account before anything else. For 2017, that means I’ll contribute $18,000 for the year and my employer will throw in an additional $6,300… that’s $6,300 of free money! In addition, 401(k) and 403(b) plans are tax-advantaged in that the money is taken out of your paycheck before the government gets its share. This means that the amount you pay taxes on also becomes less… bonus! If hit just right, that could also drop you into a lower tax bracket. And if you’re concerned that you’re going to retire early and can’t get to your funds, just remember that there are always ways around this. I’m planning to do a Roth IRA Conversion Ladder on my own 401(k) once I leave the corporate world. In my post How to Access Your 401(k) Money Penalty-Free, I talk about that method as well as another couple of options for getting your money out early. Ok, Jim – this might be hurt just a little bit… well, maybe a lot. Speaking of cool accounts that are pre-tax, a Health Savings Account (HSA) is pretty awesome. It took me a while to fully understand just how cool this type of account is, but now I get why this can be one of the best investment accounts out there. Yes, it’s pre-tax like a 401(k) plan, but that’s only one important part of it. An HSA plan also gives you tax-free withdrawals when used for medical expenses. This is the only one of the investment accounts out there that I’m aware of that can completely eliminate Uncle Sam getting a cut! So that’s the part of HSAs I had already understood. However, what I recently learned is how you can actually take advantage of a type of loophole in an HSA to make them even more beneficial. The Mad Fientist wrote a great post called HSA – The Ultimate Retirement Account that discusses how you can pay for your medical expenses out-of-pocket and then pay yourself back from your HSA. Oh, I’ll tell you why! Because there’s not a deadline for paying yourself back. So if you’re able to do so, you can pay your medical bills out-of-pocket and hang onto your receipts. In the meantime, the funds in your HSA continue to grow tax-free. Then you can basically use this as a retirement account to pay yourself back later on… tax free (up to the totals of all those saved receipts for past years). This then turns this account into one that allows for tax-free contributions, tax-free growth, and tax-free withdrawals. That, to me, makes this one of the best investment accounts out there. The bonus is that a lot of employers are now kicking in some amount of money when you invest in it. If that’s the case, this becomes another easy decision since you’re getting free money out of the gate. For some folks, this can even be a better investment than your 401(k)/403(b). You have to do the math on your employer match for your 401(k) or 403(b) and figure out if it’s a better deal than the HSA with its loophole and any money your employer throwing in for it. The federal maximum you can contribute to an HSA for 2017 is $3,400 for an individual or $6,750 for a family. This will be the first year I’m going to be maxing out this account and my employer will end up throwing in a little over $600 for the year for me. 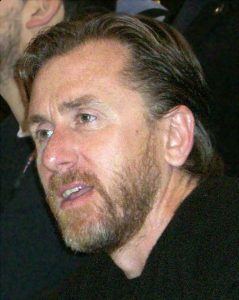 Tim Roth is cool… “Be cool, Honey, Bunny!” But Roth IRAs are even cooler! So far, we’re a good $24,750 into my investment accounts (401(k) and family HSA). It took me a number of years to be able to be able to max these out. Now that I’ve taken advantage of the accounts where I’m getting the hookup on free money, it’s time to talk about another account to max out. The Roth IRA is one of my favorite accounts. The only reason I don’t recommend it first is because accounts with free money from your employer are generally hard to beat. The problem is that we tend to push to the back of our minds that we’re going to have to pay taxes when we take it out. So that balance isn’t all yours… you get to share it with the government. With a Roth IRA, what you see is what you get. I like that… very simple. The other great thing about a Roth IRA is that you can take out your contributions at any time without penalty. So if you have $50,000 that you contributed to your Roth over the years and it’s grown to $75,000, you can take out any of that $50k without penalty (or taxes). Obviously, this isn’t something that should be taken lightly, but it’s nice to know that in a dire emergency, you have this as an option. Roth IRAs are generally thought of great investment accounts for younger folks. The idea behind that has always been that they’ll pay the taxes while in a lower tax bracket before their careers start escalating. Thus, they should come out ahead because they won’t have to pay taxes taking it out when they’re likely in a higher tax bracket. However, a recent study by Nerd Wallet found that if you make the maximum IRA contribution each year, you’d always come out ahead in the Roth IRA over a traditional IRA regardless of your present and future tax rates. Studies are studies, but this is good information to factor into your planning. The maximum you can contribute to a Roth IRA for 2017 is $5,500. If you’re 50 or over, you can contribute an additional $1,000 for a total of $6,500. There are some ways around this limit, such as using a backdoor Roth, but that’s a topic for a different day. This will be the first year I’ll be able to max out this account as well. Tie up loose ends and max out your 401(k)… see what I did there? Tie? 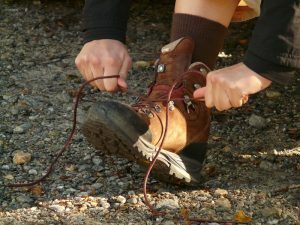 Like shoelaces? No? Whatever… never mind. After contributing to the other investment accounts, if you still have money to invest, I think it makes sense to go back to your 401(k) and finish maxing it out. Even though you already got your free money out of it from your employer, it still has some juice left in it. After all, this is still a tax-advantaged account so you want to make sure to squeeze the rest of that juice out of it. As I mentioned earlier, the federal maximum for these accounts is $18,000 for 2017. Not much else to say on this one. Fund your 401(k) or 403(b)… do your best to max this out every year. You’ll be happy when you look back at it years from now. Going back to my own situation, this doesn’t really apply to me. I max out my 401(k) out of the gate since my employer doesn’t have a limit on the match so check this one off the list for me! I think this is supposed to be my example of the tax man coming after me… or it’s me running from the tax man. 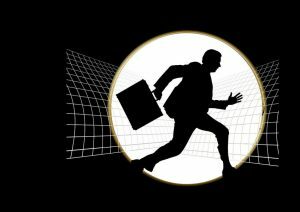 Just kidding, don’t run from the tax man – jail time should not be part of the early retirement plan. You’re still following along and have more money left to invest? Nice job!! Well, the last of the investment accounts I have out there are our taxable accounts. We currently have one taxable brokerage account at TD Ameritrade. It’s not a Roth IRA and it’s not a traditional IRA – it’s just an account we have to hold investments outside of those tax-advantaged accounts. Currently, we don’t have a lot in this account but that should change in a couple years. Additionally, we have our joint savings account (borrrrrring!!). Ok, well, that’s the whole point of a savings account – it’s supposed to be boring. We keep building it up and then tearing it down with funding our rental properties. We’re actually “shopping” now and hoping to be pick up another duplex in the very near future. After that purchase, we’ll probably get one more next year and then we should be done acquiring properties. At that time, we’ll plan on building up our joint savings again as well as our taxable brokerage accounts for our early retirement. In the meantime, our savings has been kind of a tweener account for us as to our funding order. Because we want to keep building up our rental property portfolio, we currently put about $1,500/month into the account. That’s a good portion of why we haven’t been able to fully max out some of our other accounts in the past. Once we’re good on the rental properties, we’ll probably decrease this slightly and start contributing more to our taxable brokerage accounts. Ok, I’m back… Solo 401(k)… man alone at a lake… solo… get it? Ah, forget it – I’m outta here. Here’s another one I’m hoping to throw into my mix in the near future. I’m still learning the ins and outs of this type of account, but I do know that it can be a great opportunity as an entrepreneur. Between a few of my small businesses (including this one and the real estate rental properties LLC), this could be a smart way to use some tax strategy to increase our wealth even more. What I need to work on now is learning the details of the account and how to best fit it into our strategy. I’ll do another post on this once I figure out how to work this into our game plan. So that’s about it for the time being, but obviously, as time goes on, this will change. Now remember, this is my funding strategy based on my current investment accounts. Your circumstances are probably somewhat or completely different. And even if they’re not, maybe your strategy might be a little different for other reasons. Maybe you have the option for a 457 plan or a Thrift Savings Plan (TSP) or even a Roth 401(k) (I wish I had that one!!). Or, maybe you have a 529 plan for your kids that you want to take a little more priority. We have a 529 plan for our daughter, but we don’t contribute a ton to it. In fact, our regular scheduled contributions are only $125 a month. 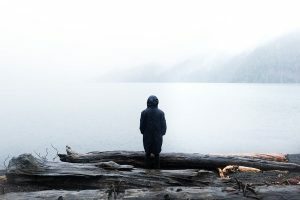 I’m a believer in the school of thought – “your kids can get loans for college, but you can’t get loans for retirement.” We’ll probably be able to help her out more as our income increases throughout our game plan, but for now, that’s where my mind’s at. However, you might disagree and that obviously will change your funding strategy from mine. Either way, I’d love to hear your thoughts on your investments accounts. Is my strategy on funding my investment accounts similar to yours? What do you do differently? ← Will You Be Part of the 1% to Be Financially Independent by 50? Employee stock purchase plan (15% discount of employer stock cost on purchase, sell immediately)- dependent on employer offerings. Then tax accounts if I ever chance to make it that far. Dependent Care FSA is an interesting one – I haven’t heard of that before. I did some quick digging and that looks to be a really smart option – wish I had taken advantage of that while my daughter up until my daughter got done with preschool. Thanks, Amanda – sounds like you and I are right on par with this. I’ll post about the Solo 401(k) once I get that all ironed out and can figure out if that makes good sense for me. When the downpayment/house fund will be done, we will start maxing out both 401(k) as well. That’s great – it sounds like you’re getting your free money from your employer and hitting the tax-advantaged accounts, which is fantastic! The solo 401k is really nice. I’ve saved quite a bit there since I left my job. I run a small hedge fund, so nope, we’re not alike at all haha. My biggest problem with all these government sponsored accounts is that they severely restrict you. They restrict when you can withdraw your money, when you can sell, what assets you can invest in, etc. You’re right on some of the restrictions, but for most people, these types of accounts are going to be the investments in front of them. If I remember right, you generally need to be an accredited investor to get in on hedge funds, right? If that’s the case, that definitely rules out the majority of investors. Do you have any experience with SEP IRAs? I think you can use this vehicle to invest in private funds, etc. I don’t have any experience with SEP IRAs personally, but I do know that you need to be self-employed or a small business owner to take advantage of them. From there, it’s based on a percentage of your income (18.6%?) as to how much you can contribute, so that can be somewhat limiting if you don’t have a lot of money coming in from self-employment. I was hoping someone would comment on that! Pulp Fiction is definitely a top 10 movie of mine and Tim Roth played his part well in it. I do something similar. I actually have to contribute 10% to a 401(a) (I am a state employee) (I get 4.3% of my salary contribution). Additionally, max out a 403b. No HSA (unfortunately), but I do try to contribute a bit to a ROTH IRA. I also have access to a 457 and I am not sure if I can/should put money in there. It adds up to about 30k in retirement funds, but I wish it could be more. $30k is a good chunk of dough, but of course, the key is how it relates to your income. I’m definitely with you on this – I spend way too much time trying to figure out how to be able to stash away more than I currently am. I have my own small hedge fund, so I reinvest most of the profits back into the fund. I’ll take a small salary that’s enough for me to live on, but nothing more. Thanks for sharing your strategy, Jim. I agree that everyone’s will be different depending on a number of factors such as current income and tax bracket, availability of match, and what investment options are available in your work 401(k). I do things a bit differently given my situation. I’m in one of the higher tax brackets, so I max out all of my pre-tax accounts first (401k and HSA). I actually forego contributing to our Roth 401k for this reason. I then fully fund a Backdoor Roth, then move on to a taxable account. I think if I were in the middle tax brackets I would still concentrate on maxing out my 401k before a Roth unless the investment choices were crappy (i.e. expensive funds). But as you said, everyone will have a different strategy.